Check our Facebook page for additional photos and updates. 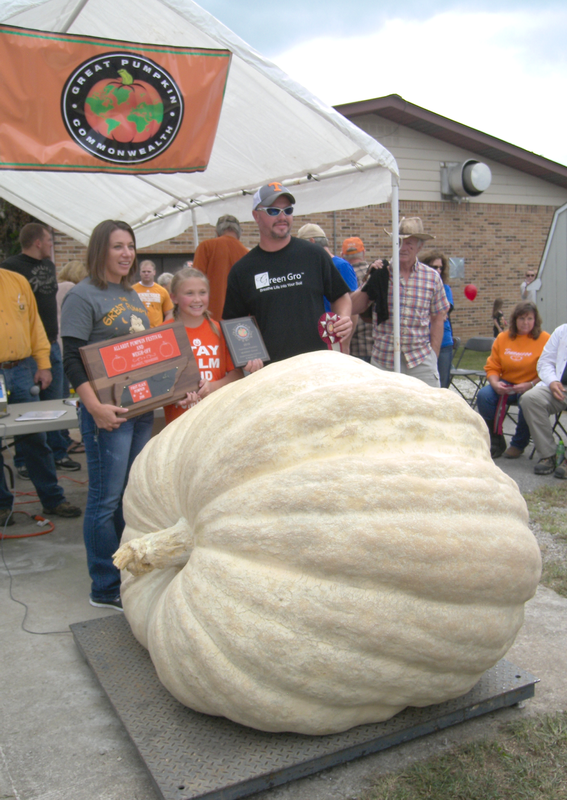 Jason Terry and family from Oneida, TN, winners of the Allardt weigh-off with this pumpkin tipping the scales at 1472 lbs.... Second place winner was Dwight and Karen Slone of Prestonburg, KY. Their pumpkin weighed 1421.5 lbs. Third place went to Malissa Bess of Smithville, TN, for her pumpkin weighing 543.5 lbs. Kenneth and Anita Gail Sparks, owners of Gail's in Jamestown and long-time supporters of the Allardt Pumpkin Festival Weigh-off as well as the annual Pumpkin Festival Beauty Pageant, were named 2016 Allardt Pumpkin Festival King and Queen. Taking second place was another giant, weighed in by Dwight and Karen Stone of Prestonberg, KY, which tipped the scales at 1,421.5 lbs. 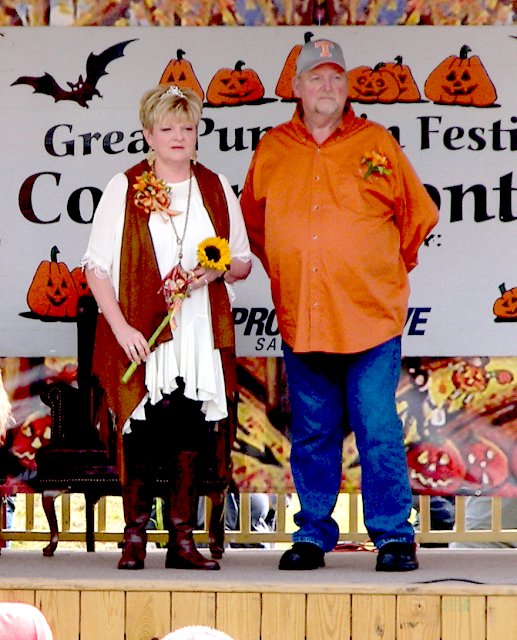 The weather this year evidently played a part in the lack of large specimens entered, with only five entries, and for the first time in the weighoff’s history, there were no entries from Fentress County. Malissa Bess of Smithville, TN took third place with an entry of 543.5 lbs, while John VanHook of Somerset, KY placed fourth with an entry weighing 490 pounds. VanHook’s pumpkin also took the honor of “Best Looking Pumpkin,” for which he was awarded the Howard Dill Award. Placing fifth with an entry of 465.5 lbs. was Suzie Zuerner of Arden, NC. Suzie also entered a Cushaw which weighed 36.5 pounds. In addition to the large pumpkins, there were also some giants entered in the Watermelon contest, with Chris Kent of Sevierville taking top honors with an entry of 290 lbs. which was 4 pounds shy of the Allardt Pumpkin Festival record of 294 lbs. which he weighed in last year. Taking second place in the Watermelon contest was Bruce Terry of Helenwood, TN, with an entry of 250 lbs, with Jeremy Terry, also of Helenwood, taking third place with a 232-lb. entry. John Bramer of New Hope, KY placed fourth with an entry of 229.5 lbs., while John Brooks of Rhonda, NC placed fifth with a 162.5-lb entry.